After Charles and Zina Card, there is perhaps no individual with a more prominent role in the history of Cardston, Alberta, than Edward J. Wood. Born in Salt Lake City in 1866, Wood had already proved his devotion to the Lord by the time he arrived in Cardston in 1901. At the age of 21, after becoming engaged to be married, he was called on a mission to the Samoan Islands, delaying his marriage several years. He returned in 1892 and married Mary Ann Solomon, and they already had two children in 1896 when he was again called to Samoa. This time, at the age of 29, he served as mission president there for two years without his wife and family. A year after his return, family members who had moved to Alberta, Canada, convinced Edward and Mary Ann to join them, and by September 1901 the Woods had arrived in Cardston. The town’s aging founder, Charles O. Card, invited Edward to assume management of the Cardston Mercantile, and Wood soon also found himself heavily engaged in Church work there. Beginning with missionary work among less active members , in his first year Wood also served as Sunday School president and before long was called as the second counselor in the Cardston Stake presidency. Less than a year later – and less than two years after his arrival in Canada – Edward Wood was called to preside over the newly created Alberta Stake. In addition to his leadership, Wood was also responsible for the colonization of 67,000 acres of Church land northwest of Cardston. He oversaw surveys of the land, identified town sites, and was the Church’s agent in selling the land. The towns of Glenwood and Hill Spring were the result of his labors. Edward J. 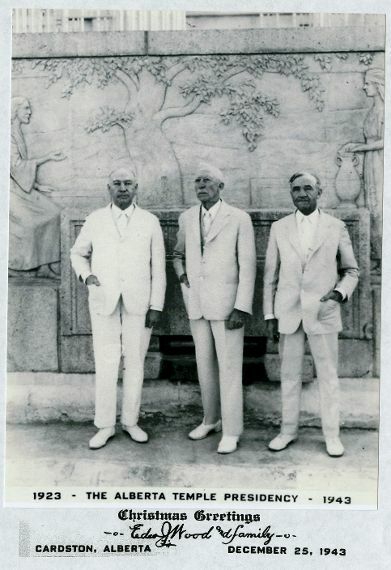 Wood and his counselors in the Alberta Temple Presidency, ca. 1943. Jay M. Todd, “Edward J. Wood: ‘Faith Personified,’” Ensign, September 1988.